Bathroom trends for 2015 indicate that walk-in showers are taking the place of the standard bathtub/shower combination. Sometimes called doorless showers or no-threshold showers, they are built at the same level as the bathroom floor and are enclosed with sturdy glass or acrylic walls and doors. Walk-in showers allow homeowners to design a bathroom with a more open feeling that makes the space look and feel bigger. They can be used to make better use of available space in the bathroom or take advantage of irregular corner areas. In addition, walk-in showers are much easier for persons with mobility issues. There is no need to step up and into a bathtub, which means the shower can even accommodate walkers or mobility devices. This is particularly useful for homeowners who are considering aging-in-place issues or for others who have an elderly relative living with them. The trend toward walk-in showers means that bathtubs are often being left out of bathroom designs. A walk-in shower means that a bathtub with attached shower is not necessary. Showers encourage energy conservation since they use less water than baths. A shower is also quicker and more convenient than a bath, which is often a better option for busy families. The exception to the trend is that free-standing bathtubs are still a popular bathroom option. 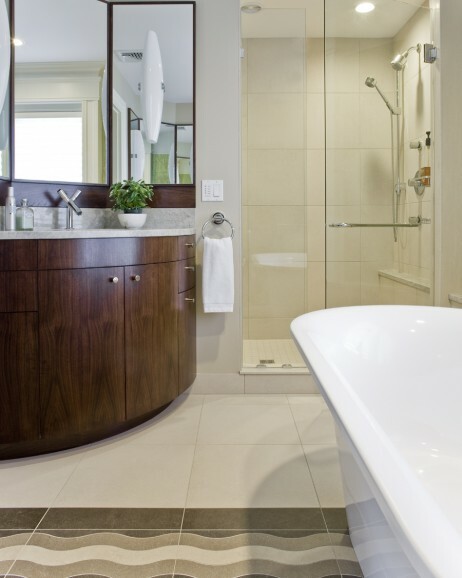 A free-standing tub provides elegance and luxury in the bathroom space. A combination of free-standing tub and a walk-in shower can easily be used in the same bathroom. Of course, just because it’s trending, doesn’t mean it’s your only choice. The more traditional bathtub/shower combinations are still a viable option. Sage Builders LLC, a general contractor in Newton, MA, provides expert residential design, construction, and renovation services for Boston-area homeowners. Contact us today for more information on bathroom construction and renovation trends, walk-in showers, and how to incorporate a bathtub in modern bathroom design.